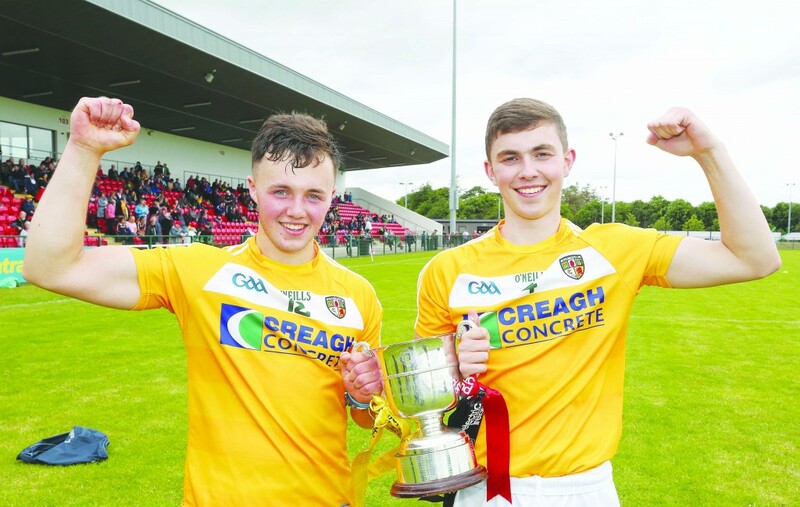 ANTRIM retained the Danny McNaughton Cup with a comprehensive 10-point win over Down in the Ulster Minor Hurling final at Owenbeg on Sunday. The Saffrons only scored one point from play in the first half but two goals after the break proved decisive. Donal McKernan scored a penalty after man-of-the-match Conal Doherty-Cunning was fouled and substitute Peter McCallin bagged a stunning solo goal in injury-time. It was an impressive performance from Antrim but their manager, Ciaran Kearney insists more will be required in the All-Ireland quarter-final against Galway. That game will take place on Saturday, July 23 with a time and venue yet to be confirmed. “I suppose, in the first 10 or 12 minutes, we were slow to get going,” said Kearney. “We were hurling okay, but boys were just taking silly options – hitting the ball at the sweeper. “Guys were winning the ball in the back line but being intercepted. “We were trying things that we had been working on and we couldn’t complain too much. Antrim were fortunate to force extra-time in their semi-final win over Derry before blowing the Oak Leafers way in extra-time to win by 15 points. Kearney bemoaned his side’s defensive stats on that occasion but Sunday’s game was more pleasing for the Antrim boss. “We said the last day that our hook and block count wasn’t enough but the stats were much better today,” added Kearney. “Going in only a point down at half-time with a decent breeze to come in the second half certainly made the difference. The Saffrons suffered a blow prior to throw-in when it emerged that their captain Conor Carson was ruled out through illness and was replaced by Ed McQuillan. Down were quickest out of the traps and led 0-3 to no score after 10 minutes with Conor McCrickard scoring three frees. Antrim’s poor start was perfectly illustrated when Conal Doherty-Cunning missed an easy free in the opening minute, but the Dunloy man made amends by slotting over his side’s opening three points, all from frees, to tie the game after 18 minutes. Eoin O’Neill also crashed a shot off the crossbar as the defending champions took the game to their opponents. However, Down were dominating the midfield battle and were able to create more chances and a rally of fine scores from McCrickard, Daithi Sands and Stephen McKey restored their three-point advantage. Antrim missed another goal chance when midfielder Keelan Molloy saw his shot cleared off the line by Eoin Coulter. The Saffrons got their first score from play when Doherty-Cunning slotted over in injury-time as Down led 0-8 to 0-7 at the break. The lead was wiped out on the restart as Keelan Molloy levelled the game before Antrim took the lead for the first time on 38 minutes as Doherty-Cunning landed another free. A great 65 against the breeze from Donal Og Rooney and a point from play from Ruairi McCrickard proved to be Down’s last scores of the game as the Ardsmen went scoreless for the last quarter. During that period, Antrim played some delightful hurling as they bossed proceedings until the full-time whistle. Doherty-Cunning was fouled for a penalty which Donal McKernan converted to put Antrim 1-13 to 0-11 clear. Further points from play followed from the impressive Doherty-Cunning and Eoin O’Neill before substitute Peter McCallin put the icing on the cake. The St Paul’s attacker sprinted clear of his marker, sold a dummy to another Down defender before ending a lung-bursting run by firing past Huw Flynn in the Down goal to add a touch of gloss to the final score. Despite winning the game by a comfortable 10 points, Antrim boss Kearney insists his side could have been more ruthless on the day. “There are still improvements to be made but we won the game by 10 points. We could have had a couple of more goals,” added the Cushendall native. “Some of the goal chances we had, the boys were nearly too greedy – they should have been popping them over the bar. They were trying to force it. “Conal (Doherty-Cunning) won a penalty and he is always dangerous and Peter (McCallin) made a great run to score his goal. “It was carbon-copy of the goal he scored in the semi-final. Kearney also added that both Conor Carson and Donal McKernan should be fit to play against Galway. Carson suffered an illness during the week and didn’t feature in the Ulster final. McKernan, meanwhile, has been nursing a hip injury and was substituted as a precaution after 57 minutes. For the second game in succession, Conal Doherty-Cunning proved to be Antrim’s go-to man. The Dunloy sharpshooter scored 1-13 in the semi-final win over Derry and, on Sunday, he followed that up with a 0-10 haul against Down. He missed an easy free in the opening minutes but, after that, he was pretty much flawless from placed efforts and he won the penalty which Donal McKernan converted. McKernan also had a fine game as did defenders Conor Boyd and Conor Kinsella while Conor McCrickard was Down’s best player. ANTRIM: P Carlin; C Kinsela, L Gillan, E McQuillan; S Magill, C Boyd, E Smyth; G Og Laverty, K Molloy (0-2); A O’Boyle (0-1), D Black (0-1), D McKernan (1-0, 1-0 pen); D McShane, C Doherty-Cunning (0-10, 0-8fs), E O’Neill (0-1). Subs: P McCallin (1-0) for O’Boyle (48mins), E Laverty for Black (55mins), C McDonnell for McKernan (57mins), R Crummey for McShane (60mins). DOWN: H Flynn; E Kelly, P Branagan, J Carlin; C Smyth, E Coulter, D Og Rooney (0-1, 0-1 65); R McCrickard (0-1), Declan McCartney; T Murray, D Sands (0-2), C McCrickard (0-5, 0-4fs); S McKey (0-1), A Mee, A Doran (0-1). Subs: M McKey for Murray (46mins), P Miskimmon for Doran (55mins), C Hynes for Smyth (59mins).